Before I get into the subject, I’d like to comment on a couple other blog related things. Back in March this blog was hacked (apparently an attempt to use the blog to distribute spam). Fortunately my web host detected that a bunch of files had been changed, so they “froze” the site. I ended up having to re-install the blog software to get things back to normal. It really wasn’t hard to do, but it did take some time. At the same time I took steps to harden the site so hopefully it won’t happen again. The second item concerns the New Post Notifications that are sent out to subscribers when I pen a new morsel for your consumption. The plug-in that handles that is several years outdated, and the author apparently isn’t interested in keeping it current. Therefore I elected to try another plug-in (Mail Poet) and hopefully I have it set up correctly. If you experience a problem, please drop me a line and I’ll try to get it straight. Or if you just happened to check the blog and saw this post (but didn’t receive an email notification that it was here), please let me know about that too. OK, on to the topic at hand: roundhouse floors. Several years ago I had a post in which I was pondering the different floors used in roundhouses. That led to a nice discussion, but not on the blog. Instead it was just a bunch of emails back and forth between me and a few friends. One of the floor types that I mentioned at the time (and one which I had not heard of prior to then) was a series of wooden blocks set on end to create the floor. Several of you sent me some photo examples of this. From what I gather, this type of floor was rather common, not only in railroad facilities, but also in other industrial applications, particularly where heavy and/or bulky material and equipment was being handled. My impression is that the floor is easy on things laid or dropped upon it, and is easy to repair if necessary. 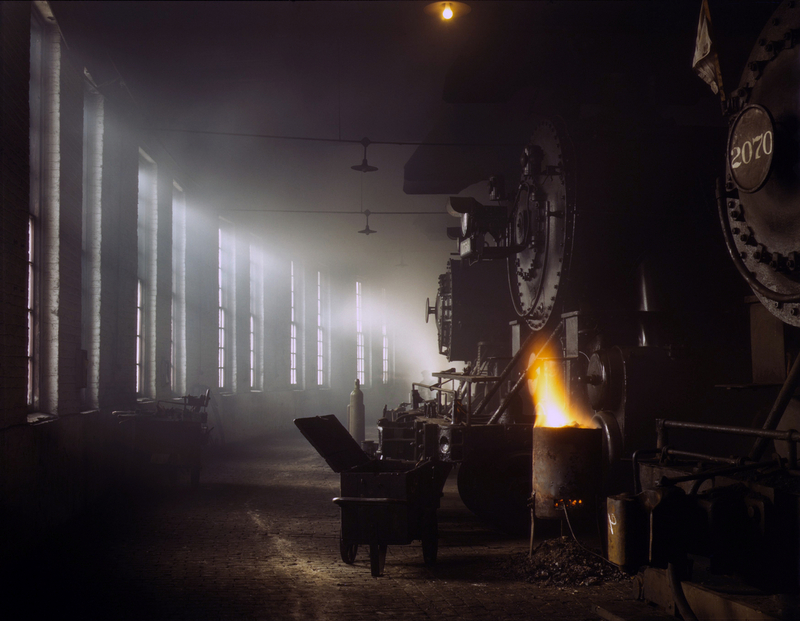 The photo below was taken by Jack Delano back in the ’40s, and it clearly shows this wood block flooring inside a Chicago and Northwestern roundhouse. You can click on the photo to get an enlarged view. Mr. Delano took many photos of railroad subjects back then, and there is currently a book available with a nice selection of his work. As usual, comments are appreciated. As another aside, the recovery of my home from the flood last August is finally hitting full stride. The drywall is up and finished, cabinet work has begun, and I am finally seeing light at the end of the tunnel! I’ve had a couple roadblocks thrown in the way of layout progress these past few weeks. This blog is powered by WordPress software and that’s where my first trouble came. Several times a year the WordPress folks release an update to the software. I have dutifully downloaded these updates and completed the upgrades without a hitch . . . rather painlessly, in fact. The latest release wasn’t so friendly to my installation. In short order, it trashed the blog site. If any of you attempted to visit during this time, you were met by a blank page (if anything at all). Fortunately I had a recent back-up of the site. But I had never actually done a restore before, and I had quite a learning curve to get it all sorted out. After many hours spread over a couple of days, I finally got things restored back to the pre-upgrade state. I think I’ll hold off upgrading the site for a period of time, at least until the next minor upgrade is released. Hopefully that upgrade will work a bit more smoothly. At any rate, I’ll make a back-up immediately prior to the upgrade attempt, and if things fail again, at least I’ll have the knowledge and experience to get the site back on line within just a few hours. Hurdle number 2: Literally the day after I got the blog restored, my desktop PC went down. Now, this is the PC that I depend on; all others are mere toys and conveniences (like, for running model railroad software). I had been experiencing a couple symptoms that something was awry for several weeks, but didn’t expect this. While not conclusive, the evidence is pointing to a failed hard drive. And naturally, I haven’t been able to find a new hard drive (of the size, type and style that I wanted) anywhere in town. So off to the internet, where I found the prize in short order and followed up with a purchase. It finally arrived this morning, but it’ll be a couple of days before I’ll have a chance to install and format it. Then I must install the operating system and the jillion programs, data items, photos, etc., etc. Fortunately here also, I have a fairly recent backup of all data, so once the programs are installed, the data will be there. The success of this however, depends on my assumption that the problem is indeed the hard drive. I’m formally requesting all readers to cross their fingers and toes. Despite all this, some progress still ensued on the layout. I’ll have an update on that in my next post. I’ve completed a major reorganization of the Layout Construction Photos section on the main website. As the layout has grown (and the number of photos has increased), I found it getting increasingly cumbersome to add material. I originally started by adding photos in a linear fashion as I worked around the layout. But as I started jumping back and forth to various layout sections, that approach wasn’t suitable. I really wanted to keep photos of a given area together, but it was difficult to do that, and navigation through the photos was poor. Now the photos are grouped, generally by the various areas of the layout that they pertain to. Hopefully this will make things simpler for all of us. I’ve had to rename a ton of files to accomplish all this. One negative side effect though was that all of the links referring to the renamed pages had to change as well. Hopefully, I’ve gotten them straight. But if you find something out of order, please drop a line and point out the error. I hope you enjoy the new format . . . let me know what you think. Last Saturday I made the pilgrimage over to Hammond to attend the annual banquet of the Southeast Louisiana Chapter, NRHS. As usual, I enjoyed visiting with the folks there, and after an excellent meal we had a nice presentation by Rick Pitcher on passenger service back in the “good old days”. Afterward I spent a few hours over at the depot and managed to catch a few trains going by. Another great day! And I’ve installed a few more Tortoise switch machines on the layout. For every comment posted on this blog, I usually get about three emails from folks who simply reply to the post notification they receive. There’s nothing wrong with that except that no one gets to read their comment besides myself. I have suspected that the log-in ritual may be a contributing factor. Perhaps folks don’t want to bother logging in just to post a comment (and that includes me). The log-in thing was an attempt to control spammers, and it’s worked wonderfully in that regard. I’ve decided to open things up a bit by eliminating the need to log in to comment (however, you’ll have to enter your name and email). We’ll try this for awhile and see how it goes. Hopefully it’ll make life easier for you folks. Now keep those cards and letters coming! As I think you’ve noticed, the home page here has a bit of a new look. The beautiful logging railroad scene is by Tony Howe, and is used here with his gracious permission. I think it really adds life to the blog, and I hope y’all enjoy it as well. Tony is a prolific rail artist and his work can be seen (and purchased) at his web site Tony Howe Railroad Art. He and his cohort David Price also have a nice railroad historical website, Mississippi Rails. Be sure to check it out (where you’ll also see the full version of the logging scene pictured above). And as usual, my progress update: the layout is moving right along. The Willis yard peninsula is about 80% complete and the track will soon start going down there. The DCC bus wiring is complete for all areas constructed and those near completion. Wayne and I made another lumber run earlier in the week, and today we ripped enough joist, riser and cleat material to carry me for quite awhile. I still haven’t posted any new photos on the web site, the last being taken in late May. But I really should take a break and shoot a few more. A good bit of work has been completed since the last pictures were posted. Edit: some new pics have been posted on the website. Click the link in the header to go there. As many of you know by now, I’ve been in the process of converting and re-building this blog for the past week. The original blog was a “canned” application offered by my web hosting site. It was limited in options, wasn’t powered by the current version of WordPress, and I found out that I couldn’t even back up the site! Well this last revelation caught me by surprise. So the solution was to build an entirely new blog by establishing my own database and using the full and current version of WordPress. It was a lot of work. The only thing I could pull off the old site were the posts and comments themselves. Everything else, including the user database, had to be built from scratch. But what you see here is the result. I hope y’all are pleased with what you see. Thanks to those who helped me debug and test things out. And I apologize for the inconvenience caused to the registered users (by having to re-establish their profile). Now, let’s get back to railroading! This is a question I’ve been asked twice in the past week. And I concede that WordPress (the software that this blog uses) is not particularly intuitive in that regard. If you wish to comment on a post, click the Comment word at the bottom of the post. IMHO this is why it isn’t intuitive. At times the “button” will say No Comments, and at other times it’ll be something like 1 Comment or 2 Comments (or however many comments exist for that post). Click it and you’ll come to the log in link, or if there are already some comments, go to the bottom and you’ll see the prompt to the log in link there. Once you get logged in, you can comment to your hearts content. Also, once logged in, you can comment on any other post without additional hassle. The reason for all this is to help control idiots, spam and bots. That’s the way the software is set up and I have no control over that. So, comment away folks. Really, it took far more time for you to read this than to log in and comment. P.S. I got a chuckle when I was about to post this and the WordPress spell checker kicked in. The word that was flagged as misspelled was WordPress. So is the Blog Working? A few days ago my web hosting site advised me that the blogging software was being updated. I suppose that is good, however as I examined the various parts of the blog, I noticed that some things had changed, some things had simply disappeared and my preferences were shot to hell. I think I have most everything put back in order now. One of the big things that changed was the subscription plug-in. Most folks know that you must first register with the blog (a one-time thing) to be able to post comments (that’s to help control spammers). However, subscribing is totally optional. Subscribing simply means that you’ll receive an email whenever I make a new post to the blog advising you that there is fresh material for you to enjoy, laugh at, sneer at, or swear at (your choice). It is unclear to me whether the subscription list is intact after this transition. If you receive a notice of this post and you’re not presently a subscriber (and don’t wish to be), please feel free to unsubscribe -or- drop me a line and I’ll get your name off the list. Sorry if this inconveniences anyone. The weekend is nearly here, and I’ve already got my plans in place for the next construction on the layout!